Baron Rosen’s Babi/Baha’i archives present private letters and diplomatic correspondence from the nineteenth century, preserved among the prominent Russian scholar Baron Viktor Rosen’s materials in the Archive of the Russian Academy of Sciences, St Petersburg branch. 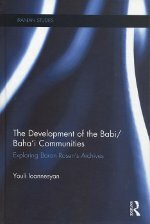 The materials cast light on the first studies of the Babi and Baha’i Faiths, new religious phenomena which, in Baron Rosen’s time, were emerging in Persia. Iran has always been a strategic concern of Russia’s geopolitical interests and the traditional importance which has been given to Persia has manifested itself in hundreds of documents and writings collected by the pre-revolutionary Russian diplomats and scholars. These documents, large parts of which have never been published before, reveal interesting information on the attitude of the Russian government towards religious and ethnic minorities as well as towards related issues within the Russian Empire and abroad. Bringing together materials in Russian, English, Persian, Arabic, and French related to the Babi and Baha’i Faiths from Rosen’s archive in the original languages with an English translation, this book will be of great interest to students and researchers in the fields of Iranian Studies, Religion, and Middle East Studies among others.